Our restaurant opens to the In-house Guests as well as Walk-in Guests. We serve the delicious Breakfast with gentle morning breeze and good view. 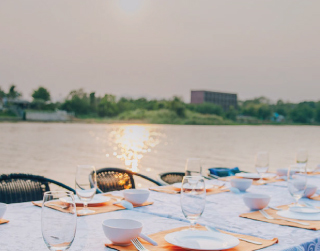 ​Good Times Restaurant is in spectacular location overlooking the River Kwai with beautiful sunset view. We serve both Thai and International cuisines in a relaxed atmosphere. Cocktails menu and Thai dessert menu are also available at our restaurant. 10:00 AM – 22:00 PM. overlooking the River Kwai with beautiful sunset view.